Today is the tenth day in the octave of Christmas and the Feast of the Holy Name of Jesus. From Apostolic times, the Church has professed that "at the name of Jesus every knee should bend, of those in heaven and on earth and under the earth, and every tongue confess that Jesus Christ is Lord, to the glory of God the Father" (Phil. 2:10). Through the particular efforts of St. Bernardine of Siena, devotion to the Holy Name of Jesus was promoted through the inscription of the monogram of the Holy Name (IHS) and the addition of the name Jesus to the Hail Mary. In 1597, Pope Sixtus V first granted an indulgence for the uttering of the phrase used so often by the present Holy Father and included among the pious invocations of the current Enchiridion Indulgentiarum: "Praised be Jesus Christ!" To celebrate this feast we can begin by explaining to our children why we must show reverence for Our Lord by bowing our heads whenever we hear His name, and by making prayers of reparation to Him whenever we hear His name taken in vain. 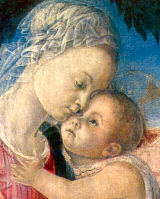 Gather your family around the creche and recite the Litany of the Holy Name of Jesus. Read the Story of St. Bernardin and the Monogram of IHS (from the Latin Jesus Hominum Salvator meaning "Jesus, Saviour of men") and serve sugar cookies which the family has cut out shapes of symbols of Jesus (see this month's overview for some ideas), including the initials IHS.